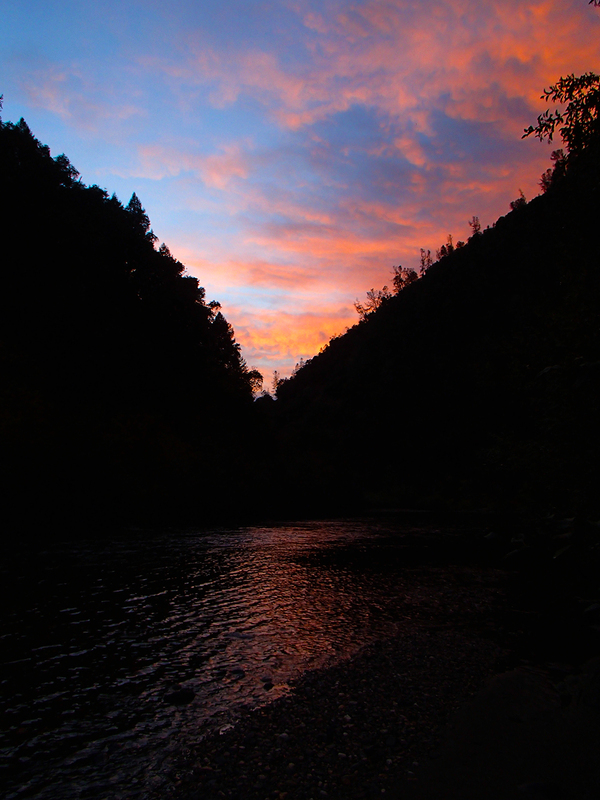 I woke up Saturday morning, threw all of my rafting gear into my car, and headed off towards Forest Hill. There was a sharp chill the air, and I began wondering how much colder it would get as I made my way into the river canyon. About 30 minutes into the drive, I hit some dense fog and a light sprinkle. That sprinkle quickly turned in to a downpour. I began wondering if rafting still seemed like a good idea. I got the AO meeting place, and was immediately greeted by two smiling river guides. They seemed completely unaffected by the rain, and looked more excited to get out on the river than anything. They really all are so smiley! 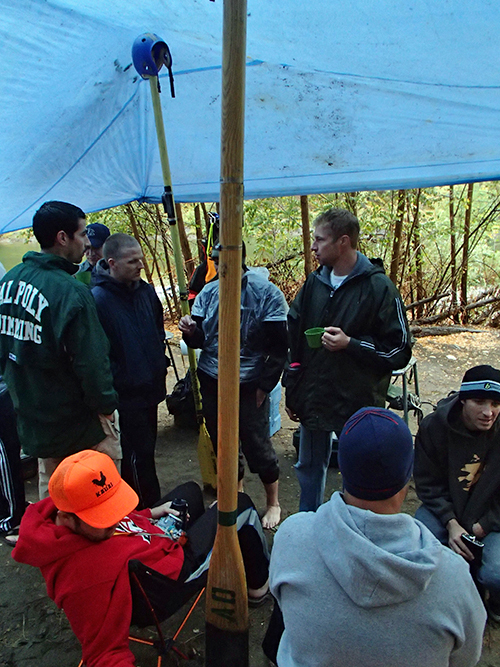 The rest of the group and I huddled under the large covered area at the meeting place. We put on wet suits and splash jackets, and began packing our gear into dry bags to keep them from getting wet. 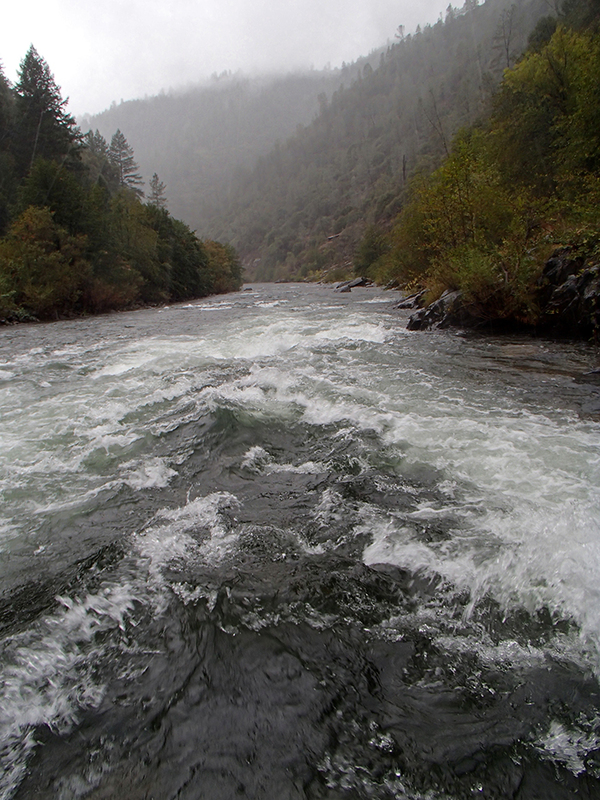 We then tossed all of our gear onto the bus, hopped in, and made our way down to the river. The scenery on the way to the river was breath taking. I have made that drive many times, but had never seen it look so serene and picturesque. We made it down to the river, hopped off the bus, and carried our rafts down to the water. At this point I was still not too pumped about the wet weather, and was questioning how this trip would play out. The SECOND we hit the water, I knew the rain was no longer a factor. When you think about it, you can only get so wet. 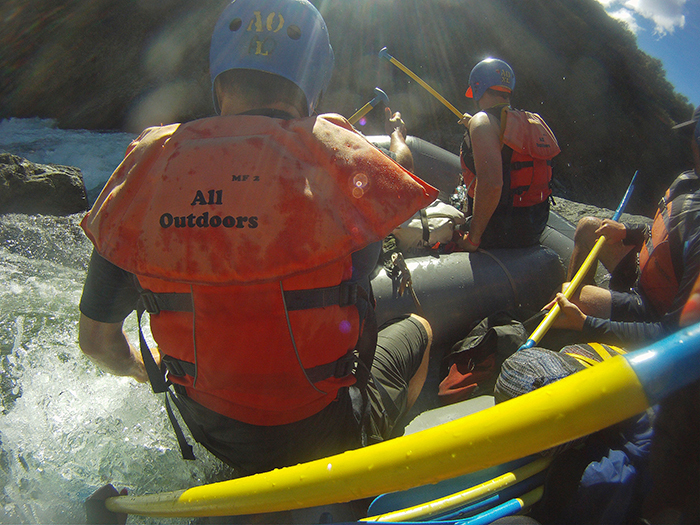 Rafting is a wet sport by its very nature. 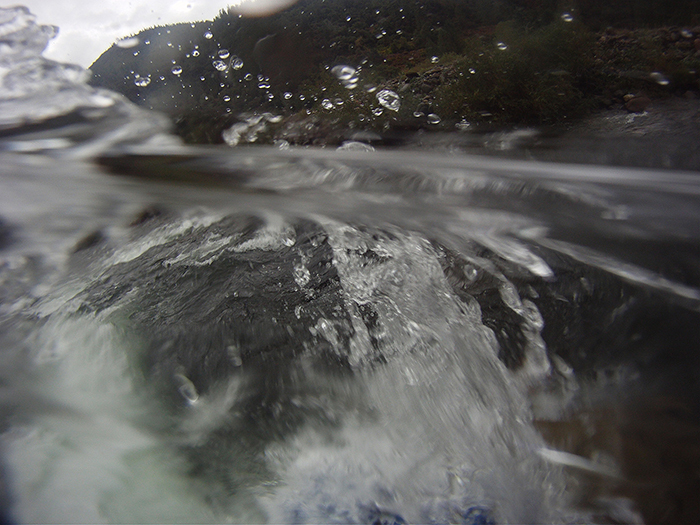 You will get wet, and the thrill of it all will make you crave a good splash in the face. I was surprised how little it was effecting me. 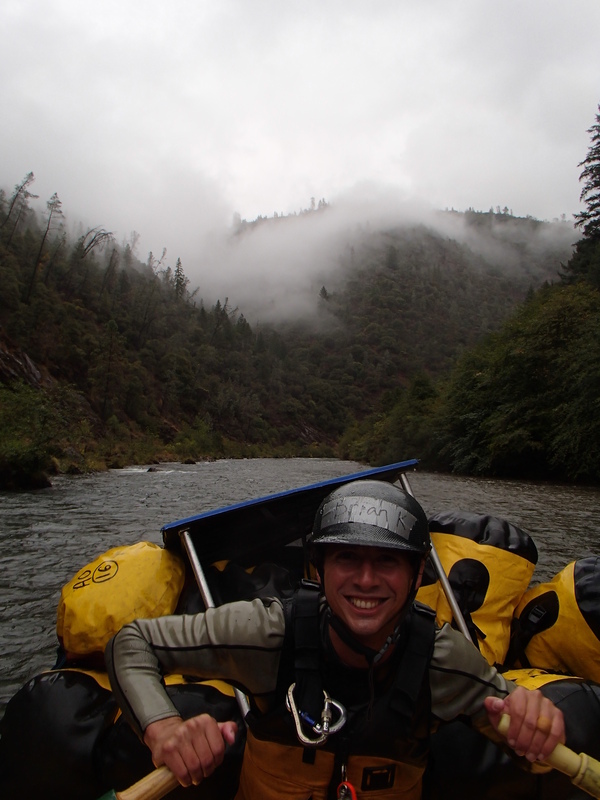 The best part about rafting in the rain is that you get to see the river and the whole canyon in a completely different way. 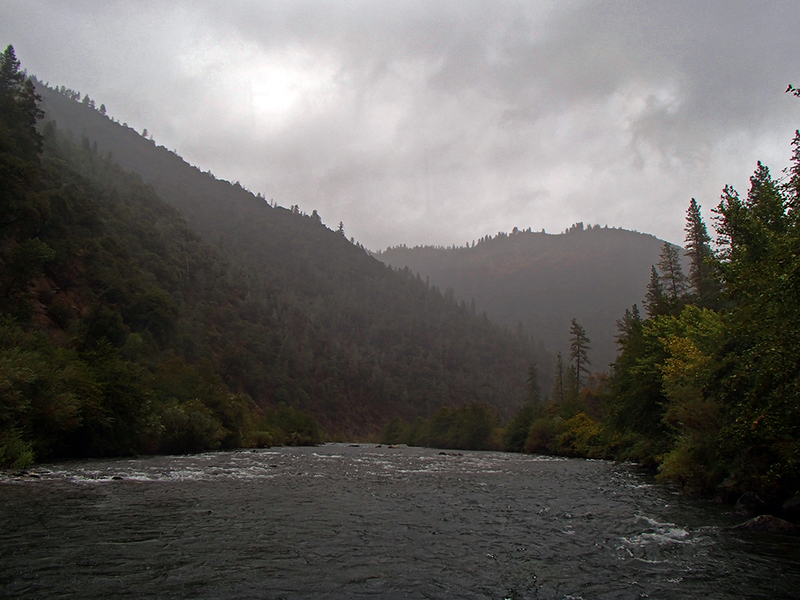 Seeing fog hover over the cliffs and rain drops dancing across the water’s surface was magical in many ways. It is a different kind of beauty that is hard to capture in words on or on film. It is by far, the most gorgeous that river has ever looked. 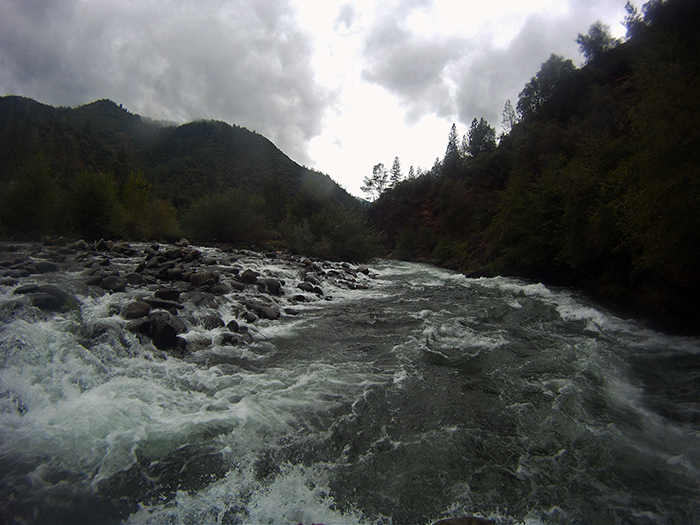 The whole day of rafting was amazing, but I began to think about camp. I know there are no covered areas there first hand. I was curious about how the guides would be able to cook and keep everyone dry, warm, and happy. Those river guides certainly are industrious, clever people. The managed to rig together a huge tarp hang out spot, and set up the kitchen right after. We had dinner under the tarp in the rain, and enjoyed each other’s company. 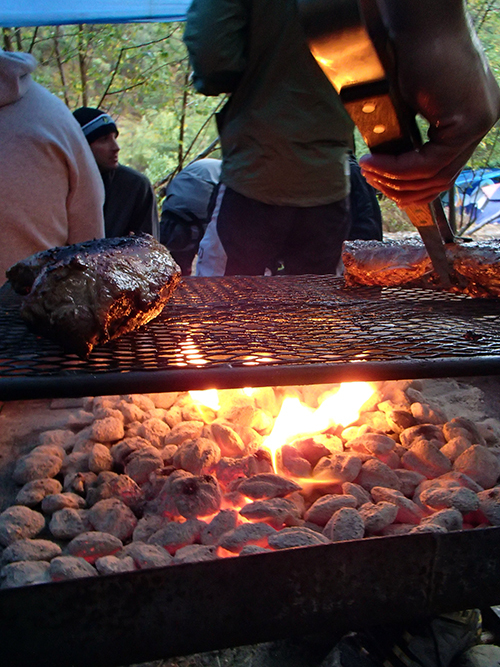 Soon after dinner the skies cleared up, and we ventured out to the shore to make a camp fire and star gaze. 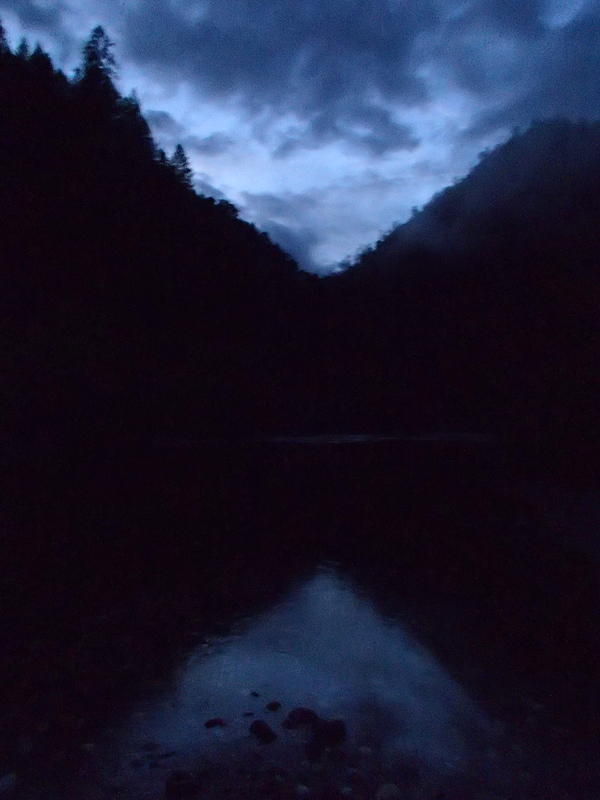 When the night was coming to a close, I made my way to my tent as it began to rain again. I fell asleep the soft sound of the of rain drops. I woke up to clear skies and the invigorating scent of the wilderness after a rain. I truly believe there is no scent quite as refreshing. I walked down to the beach and was greeted by the guides making coffee and cooking up a fantastic breakfast spread. We then proceeded to have another fantastic day out on the water. The skies were clear and the weather was warmer, yet somehow, I found myself missing the rain and fog from the previous day. When the trip came to a close, I realized it was one of the most unique experiences I have had rafting, and later decided it was one of my favorites. Don’t let bad weather scare you away from having the trip of a life time! You will be able to experience the river in a very unique way. And the beauty is something you can read about, but won’t understand until you experience it for yourself.